Years ago, I purchased a kit called "Spike Your Juice" from ThinkGeek.com. The kit included packets of yeast, instructions, labels, and an airlock with stopper. The instructions suggested buying a pasteurized (non-refrigerated) 100% juice with a high sugar content, then pitching the dry yeast into it and popping on the airlock. In a few days, the yeast would produce an alcoholic wine or cider. The results from these fermentations always seemed to range from sour to dry in flavor profile, often tasting like an unripe version of the fruit the juice was made from. It's not too surprising that I stopped using the kit before I used up all the yeast. While reading online about that kit, I saw some people suggest that Champagne Yeast would be a good substitute for the stuff the kit included, as it would ferment more of the sugars and give the finished product a bit more fizz. I tried this with some juices a couple of months ago. The results were tart and mildly carbonated. The best of them was a peach mango juice blend which kept the peach aroma and much of the fruit flavors. It was also more dry than the others, and less tart. It was an interesting experiment but I decided not to repeat it. I recently picked up a copy of Mary Izett's Speed Brewing: Techniques and Recipes for Fast-Fermenting Beers, Ciders, Meads, and More for my Kindle. As of this writing in early December, I am still working my way through the book but enjoying it. Izett has done a nice job organizing the material and explaining what to do. As the title suggests, it provides information and recipes for brisk beer, short mead, cider, boozy buch and kefir beer, spirited soda, and more. While reading the chapter on ciders, I saw Izett's table of the different yeast types and how they affect the flavor of an apple cider. I'll summarize the chart here because I think it's useful stuff. Champagne Yeast: Gives a tart, clean, almost apple-free aroma. The flavor is tart with low to medium apple flavor, dry, and clean. American Ale: Gives a strong apple aroma, hints of candy apple and other fruit. The flavor is fruity, sweet, and definitely retains the apple. English Ale: The aroma is green apple, bright, fruity, and slightly bubble gum like. The flavor is bright, clean apple with some green apple and mineral notes. German Wheat Ale Yeast: Aroma is sulfury, with low to medium apple aroma, and maybe some honey or spice. The flavor is phenolic, earthy, and applesauce like. Belgian Ale Yeast: Aroma is sulfury, funky, floral, and lightly apple-like. The flavor is sulfury, floral, dry, funky, and a little tart. Saison Yeast: A light apple aroma with some mineral, floral, and herbal elements. The flavor is balanced, slightly tart, floral, dry, and medium levels of apple. My experimentation with the Spike Your Juice kit and the Champagne yeast told me that the best result I'd gotten was from the Peach Mango juice blend and apple juice, with a berry blend having a great aroma but simply being too tart. I wanted something sweet, or at least not so tart. Izett's chart suggested that American Ale yeast would yield a sweeter cider, and probably a sweeter version of the peach mango blend and berry blend. When I visited a nearby grocery, I picked up a gallon of 100% apple juice, an Ocean Spray Wave Berry Medley with White Cranberries, and a bottle of peach mango juice blend. Over a week later, the yeast had settled out of the Berry Medley jug. I put that in five 12-ounce bottles along with a carbonation drop in each to hopefully carbonate the finished product. I tasted some of the "trub" in the bottle and it was still very sweet. At this point I don't know if that means the yeast didn't ferment the juice at all, or if Izett is right and the American Ale yeast does leave the cider sweet. We'll know on December 17 when the stuff is ready to open. The Welch's Peach Mango stopped bubbling next, and was bottled on December 7. A sample of the trub showed that it, too, was sweet but also slightly tart. It was a nice flavor and I'm looking forward to seeing what it's like when it's tested on December 21. The two plastic jugs in the photo received only Safale S-05 American Ale yeast, sprinkled right on top of the juice in the jug. A sanitized airlock was immediately placed on each. The glass jug on the right has a recipe of my own concoction. The raisins, cinnamon, yeast nutrient, and vanilla were covered with tap water and boiled for 5-10 minutes on the kitchen stove to sanitize them and release their flavors (and great aroma). The liquid was strained off of the other ingredients and poured into the sanitized gallon jug. 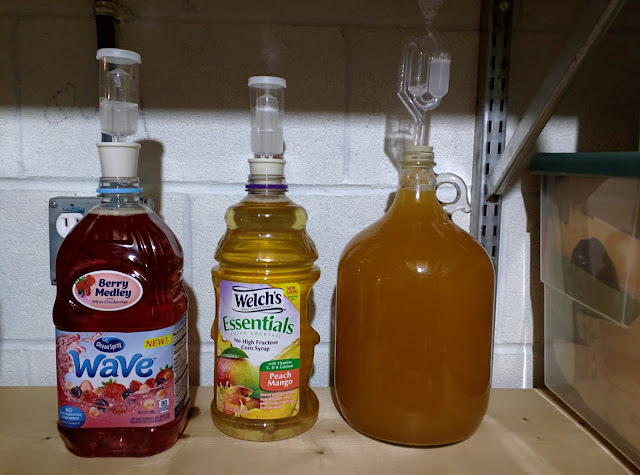 The jug was then filled with the gallon of pasteurized apple juice and capped with the stopper and airlock you see in the photo. This was done on approximately November 23, 2015. As of this writing on December 12, some 19 days later, there are still bubbles going through the airlock about every 45 seconds. I'm planning to let it ferment until the bubbles seem to have stopped completely, then bottle it. It remains to be seen/tasted if the concoction lives up to its name. I'll share tasting notes on these when they're ready to drink. 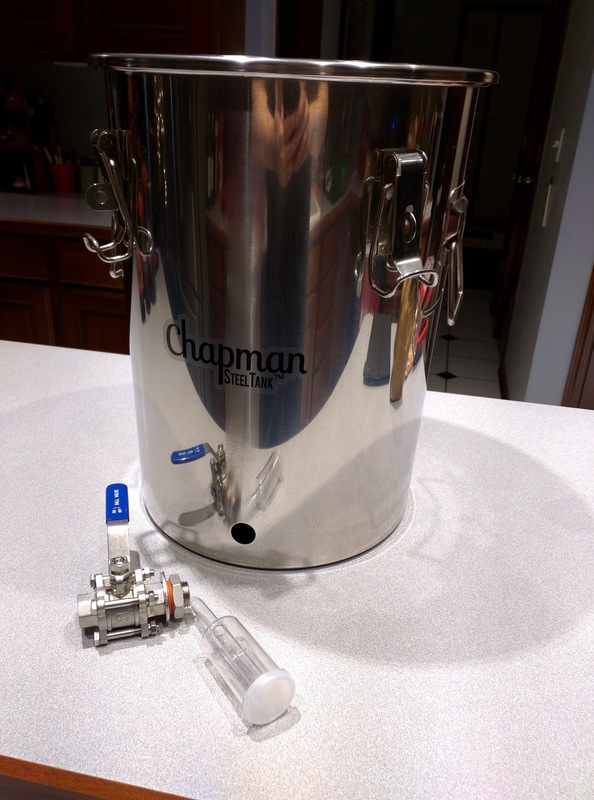 Recently, I found the Chapman Brewing Equipment 7-gallon SteelTank stainless steel fermenter on sale on Amazon for approximately $110. That's about half the price of the other stainless steel fermenter I own, Ss Brewing Technology's Brewmaster Bucket. In fairness to the Brewmaster Bucket, the Chapman fermenter lacks a number of features. The Chapman has no legs underneath it. It's not designed to stack multiple fermenters on one another. It has no thermowell or thermometer. It doesn't have a conical bottom to catch yeast and sediment. It also doesn't have a spigot you can use for bottling. So the extra $100 buys a few features you're not getting here. That said, there is nothing wrong with this fermenter. It seems very well made from 304 stainless steel. There are good strong looking handles. The gasketed lid can be clamped down for sealing and safety when carrying. It even ships with a 3-piece airlock. Bear in mind as you read the rest of this review that I do nearly all of my brewing either as extract batches on the kitchen stove (a technique I am phasing out rapidly) or as all-grain batches in The Grainfather RIMS system. I transfer directly from the kettle to the fermenter using gravity in the case of extract batches on the stove, or via the Grainfather's excellent counter flow wort chiller and pump in the case of the all-grain batches. I typically don't transfer from a primary to a secondary fermenter unless I believe the beer will improve in quality and flavor from the transfer, which isn't often. On some occasions I may bottle directly from the fermenter (using carb drops as the priming sugar) or I may do a gravity transfer from the fermenter to a plastic bottling bucket with priming sugar and possibly rehydrated bottle conditioning yeast. The Chapman meets most of those requirements, so I'm going to focus the rest of this review on three features it doesn't seem to have out of the box. First, there is no thermowell on this fermenter. That means you'll either have to modify it to add one, or do without it. Right now, I'm doing without. This is a feature of the Ss Brewing Technologies Brewmaster Bucket that has been a big help when maintaining fermentation temperature using a fermwrap and digital controller. 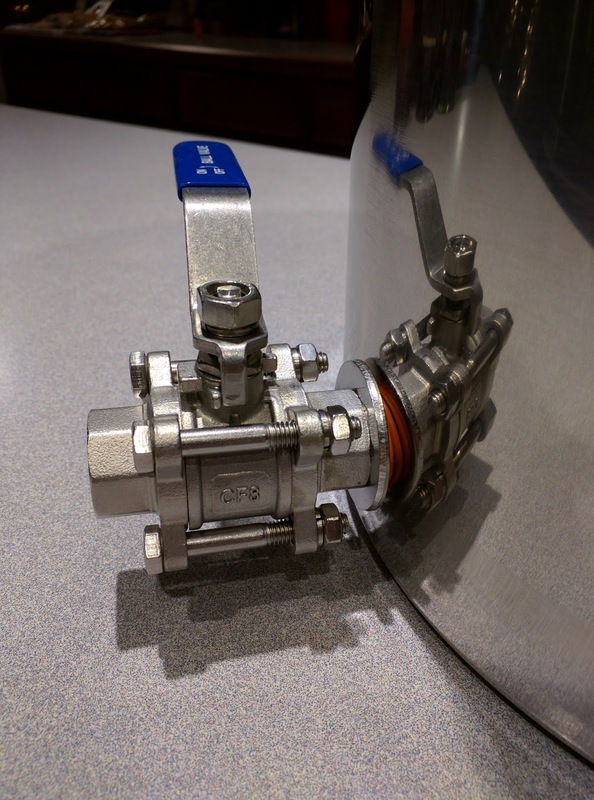 Next, the valve on this fermenter is designed for a traditional tiered pump-through setup. 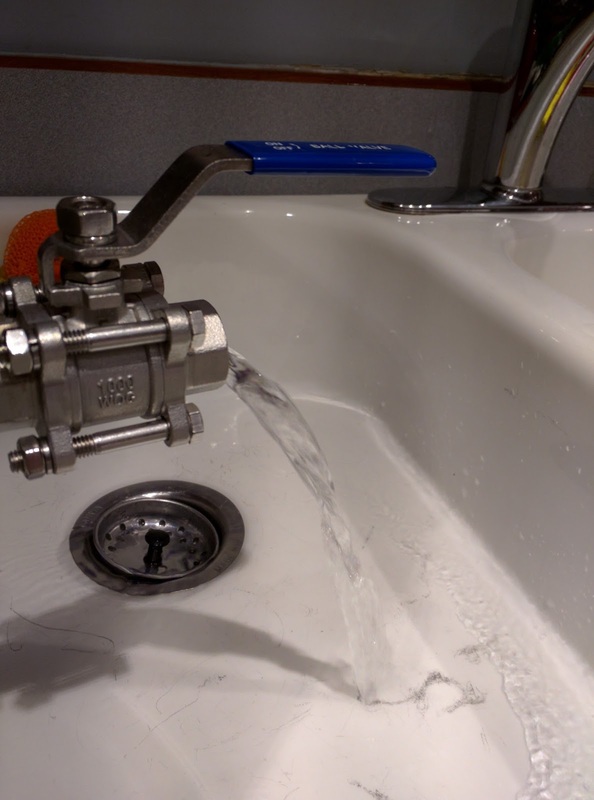 Make no mistake, this is a heavy-duty, well-made ball valve. When it's not connected to the fermenter, it's a hefty item to hold in your hand. It's attached to the kettle by a threaded fitting and rubber O rings. As with any weldless design, it's important to avoid over-tightening this valve. If you over-tighten, you're likely to see leaks. Chapman includes Teflon tape to help better seal the valve. I recommend using that and being careful not to over-tighten. You'll also want to fill the fermenter with tap water deep enough to cover the valve and leave it for a while. This will tell you if there is a leak before you lose valuable wort. As I said, it's a nicely made valve. It's also pretty stiff to turn. Opening and closing the valve will flex the sides of the fermenter a bit. I'm betting with lubrication and use you can loosen it up a bit. The only spigots I had on hand were from bottling buckets and were too large a diameter to be used with the Chapman. I've ordered a couple from Amazon and hope to try those soon. 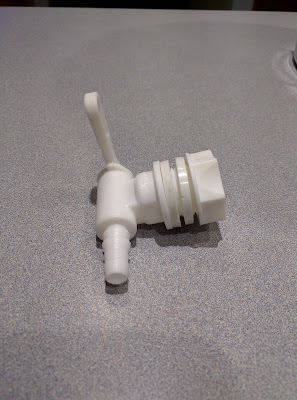 I know I could probably have visited a hardware store and gotten fittings to add to the factory ball valve to adapt it to my needs, but I think it would have added to the already bulky nature of the valve. 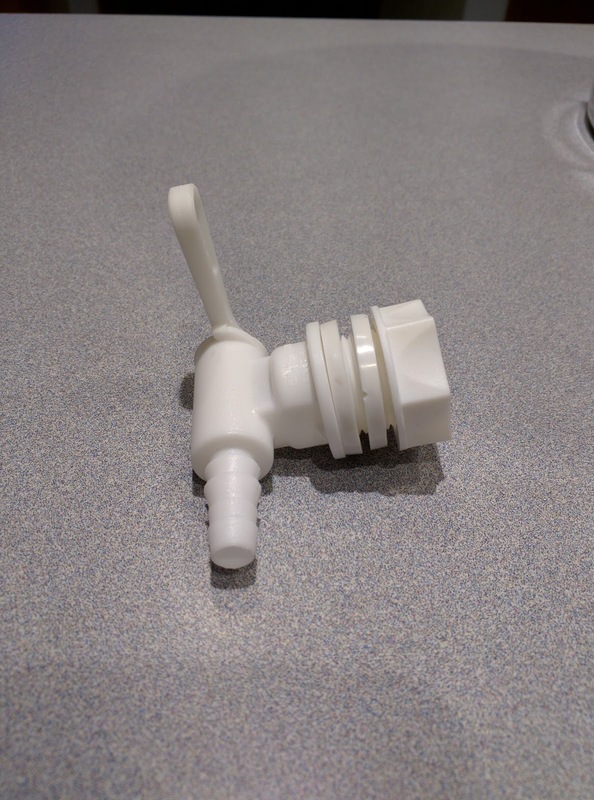 Update 12/20/2015: I ordered two spigots from Amazon.com. One was a nice metal one, but didn't seal properly due to the rubber gaskets included with it. 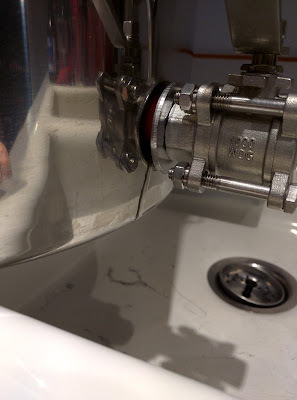 The other spigot worked well once I got it to seal properly and has been installed on the fermenter. I'm hoping it will make bottling easier than the large factory valve pictured above. One thing I really do like about the Chapman is the embossed volume marking inside. They're large, very easy to read, and won't be rubbing off or fading. There's no question how much wort is in this fermenter and I don't need reading glasses to find out. Like the Ss Brewing Technologies Brewmaster Bucket, the Chapman has a gasketed stainless steel lid that can be snapped into place with built-in clamps. This should prevent the lid from coming off accidentally or leaking wort during transport. Unlike the Brewmaster Bucket, though, the hole in the lid of the Chapman is gasketed and designed exactly to fit a standard plastic airlock. You won't be adding a large-diameter blow-off tube to this fermenter (unless you choose to modify the lid to accomodate that). Since I do a fair number of higher-gravity beers (8 to 12% ABV) this could prove problematic for some batches. Time will tell. The handles seem strong and solid, and able to carry the bucket when full. This is a good quality, well made fermenter. No question about it. It feels as well made as my Brewmaster Bucket, and I expect to get a lot of use out of it. I'd like to see a thermowell, a different valve option, and the ability to install a larger diameter blow-off tube out of the box, but I don't consider those deal-breaking features at the price. If you're looking to get away from plastic fermenters and are tired of lugging around heavy, breakable carboys, this seems like a good option. It has an entry-level kind of price, but it's not entry-level quality. The steel is reasonably thick, the handles seem sturdy, the lid appears to seal well, and the factory ball valve seems to be a good one as well. I can't say that I like it as well as my Ss Brewing Technologies Brewmaster Bucket, but it's hard to honestly say that I like that fermenter enough to say it's worth twice the price of this one. I like the Brewmaster Bucket's conical bottom, its valve, its ability to stack on top of another Brewmaster Bucket, and its blow-off tube option... but are those worth $100 more? I don't know. All in all, the Chapman 7-gallon fermenter is a good product and I expect to use it often. If you're interested in getting one for yourself, they're available on Amazon.com and from the manufacturer's web site. A 14-gallon model is also available. Last Christmas, my stepchildren (aged 21+, FYI) surprised me with the four-pack of "reindeer beers" pictured at the left. Purchase plastic stick-on "googly eyes", red plastic stick-on pom-pom "noses", and pipe cleaners. Stick the eyes and noses on the bottle necks as seen in the image at the left. Cut some of the pipe cleaners into small pieces, about 2-3 inches long. Leave the rest at full length. Wrap a long pipe cleaner around the neck of the bottle, just below the cap and spread the ends out to make the "antlers". Then take one of the small pieces of pipe cleaner and tie it around each antler to give it the shape seen above. 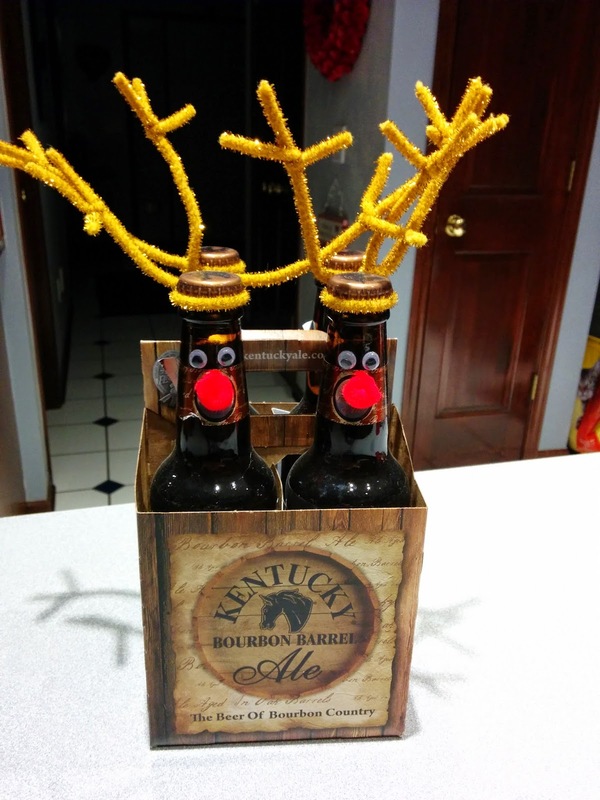 It's a craft item that won't take you very long to do and is sure to bring a smile to your favorite beer lover. Home brewers can use this same technique to decorate their holiday beers for gift-giving. As a fan of Belgian style ales, I've long wanted to try Westvleteren XII. It's considered to be one of the very best of the Belgian abbey ales, and by most accounts deservedly so. Unfortunately, it's not offered for sale very often in the US. 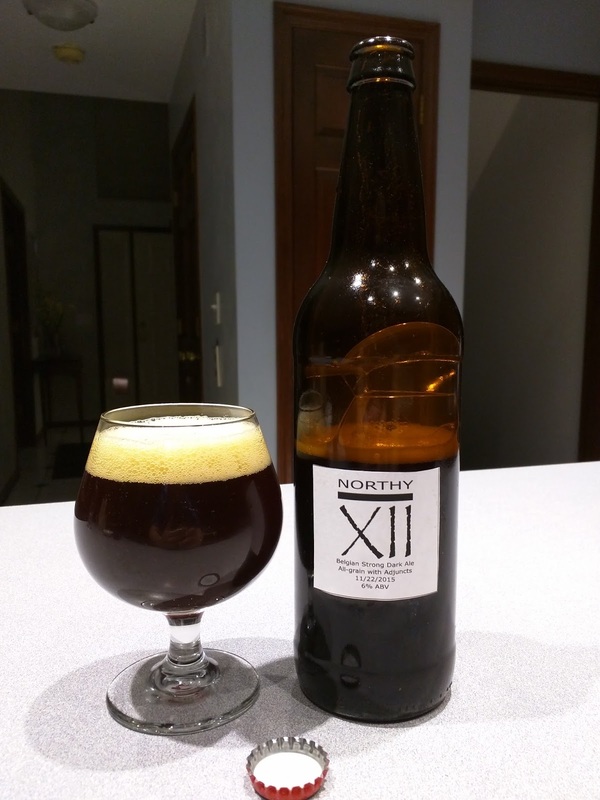 Northern Brewer's Northy 12 Belgian Quad is reportedly a close approximation of Westvleteren XII. I purchased the kit recently and decided to brew it. Northern Brewer's kits ship as a collection of loose components in bags inside a box. I'd ordered the kit with some other items, so separating out the components of the kit from the other items in my order took a few minutes of careful examination to make sure I had it all, and wasn't accidentally slipping the wrong thing into my Northy XII ingredients. The recipe begins with a Saccharine rest at 149F for 60 minutes, followed by a mash out at 168F for 10 minutes. Once the boil begins, the Brewer's Gold pellets are added first, followed by Hallertau at 30 minutes left. Styrian Goldings and the Candi Syrup are added with 15 minutes left in the boil. The wort should then be chilled to an appropriate temperature for the yeast, 64F-72F would work for any of the recommended yeasts. The beer should hit an original gravity of 1.090. It should spend 2 weeks in the primary fermenter and 3 months in the secondary, followed by two weeks of bottle conditioning. Compared to some of the kits I've made, it's relatively simple. As this was an all-grain brew, I used my Grainfather RIMS system to do the brewing. I calculated the recommended amount of mash water, then filled the kettle with distilled water. To this, I added a packet of Accumash water treatment designed to match the beer. (It came free with the kit at the time I ordered it.) I'd never used Accumash before, but it's very easy to work with. I got the water to 149F and began slowly adding the grain, stirring to make sure it all got wet and didn't clump up. When all 16 pounds were added, the Grainfather's grain basket was relatively full (it's designed to hold 20 pounds maximum, so this was pushing toward its limits). I got the lid in place over the grain and started the recirculating pump. A few minutes later, I checked back and the temperature had dropped to 125F. Apparently the grain contained enough dust or particulate matter that it fell through the basket and onto the bottom of the Grainfather's kettle. This caused the thermal cut-out switch (designed for scorch protection) to trip. Repeated attempts to reset the switch failed. I was eventually forced to lift the grain basket out and set it in a clean steel kettle. Using by brewing spoon (and eventually my hand) I managed to get enough of the sediment off the area of the Grainfather's kettle where the heating element is located. I could then get the mash water back up to the desired temperature of 149F and reintroduce the grain. This left a mess on the floor and side of the Grainfather kettle that I had to clean up. This extended "mash process" took about four hours from beginning to end. Because of the issues with particulate matter during the mash, the grain spent around two hours in the 125F range, and a while below that as I cleaned up the kettle. Once the particulate matter was dealt with, the mash did spend 60 minutes at 149F and 10 at 168F. With the mash completed, I began the boil. Fortunately, my earlier cleanup efforts did the trick and the thermal cut-out switch didn't trigger again for the rest of the brewing session. From here on, the brewing process was pretty much "textbook". I completed the 60-minute boil, recirculated wort through the counter flow chiller into the kettle until the kettle temperature dropped to 140F, then pumped it into my fermenter where it arrived at 72F and ready for the yeast. At the start of my brew day, I smacked a very fresh pack of Wyeast 3787 Trappist High Gravity ale yeast. By the time the beer was in the fermenter, the yeast pack had expanded considerably and was ready to pitch. I took an original gravity reading and volume measurement from the markings in my fermenter, then pitched the yeast. As I write this and post it on December 3, 2015, the beer is finishing up primary fermentation. Although the recipe calls for racking the beer to a secondary, my experience has been that I can't tell a difference in the beer when it's not racked to secondary, so I'm planning to leave it in the primary for the full three months. Update on 12/20/2015: The beer has been in a plastic fermenter (because my stainless was busy) for about a month. Concerned about possible autolysis and off-flavors from remaining so long in the plastic bucket, I sanitized by Chapman SteelTank fermenter and transferred the beer to there. I'm planning to let it condition in that fermenter until it's ready to bottle. The beer pours a nearly black color with finger thick head that lasts a minute or so and then reincorporates into the beer. The aroma mixes malt, dark fruit, and hops. Reviews of the real Westvleteren XII describe it as having a good balance between sweetness and hops bitterness. Reviewers describe flavors like dark fruit, raisin, brown sugar, banana, and clove. Given that, I'm almost positive that the troubles I had with the mash, the sparge, and hitting gravity/volume targets have pretty much assured that my finished beer bears little resemblance to what Northern Brewer intended. It also bears little resemblance to Westvleteren XII based on the reviews I've read of that beer. The flavor of this beer starts with a mix of hops bitterness, a hint of coffee, and a hint of dark fruit. Probably because of the mash issues, the beer is pretty dry. There is virtually no sweetness to this one. Unfortunately, there is also a fairly pronounced tannin presence. Most likely this means that my sparge water was too hot, or that I used too much of it (or both). The tannin element gives the beer a drying quality that I don't care for. Despite the fact that things simply didn't turn out well on this one, it's not a complete loss. It's definitely not the best beer I've ever made, but it's not one I need to throw out, either. It's one that I'll keep around and drink occasionally until it's gone. Is it the Westvleteren clone I was hoping for? Sadly, no. Would I make the kit again? Possibly, though there are some other Westvleteren clone recipes I want to try first. Would I buy another Northern Brewer kit? Of course. My failure to brew this properly wasn't their fault or their kit's fault. Changing from an extract brewing process on my kitchen stove to an all-grain brewing process with The Grainfather was a lot to change at once. I had issues of varying impact on each batch, with the most common one being what I experienced here - a beer that was well below the recipe gravity and well above the final volume. Since brewing this batch, I've learned that I was calculating sparge water incorrectly for The Grainfather. I've also learned that it's a good idea to calculate the "quarts per pound" ratio of mash water to grain. If it's much above 1.5, I need to extend the mash time to compensate for the thinner mash. The last batch I made used the correct sparge calculation and an extended mash time. It came out on target for both volume and gravity. If I do this beer again, I'll fix that. Another problem I had with this batch was that once I realized I needed to increase the gravity by boiling down the wort, I couldn't. I'd used muslin bags for my hops, which dropped to the bottom of the kettle where I was unable to retrieve them. If I'd extended the boil for another 30-60 minutes to help reduce the volume and increase the gravity, I'd have made the beer a lot more bitter. I'm not a fan of overly bitter beers. Since brewing this beer, I've purchased a hop spider from iMake so that if I happen to miss my gravity or volume mark again, I can pull the hops out and continue the boil until I'm closer to the target. 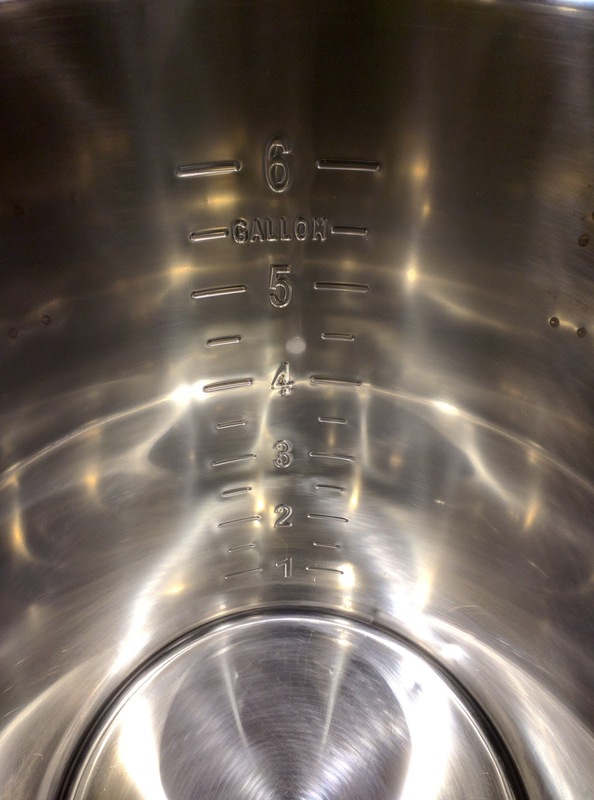 Calculate mash and sparge water volumes correctly. If appropriate, extend the mash time to ensure full conversion. Use my new hop spider so that if I needed to extend the boil to hit my gravity and volume targets, I could do so without adding bitterness to the beer (which is bitter enough as-is for my personal tastes). Have some light DME on hand to increase gravity if necessary. Use my temperature controller and fermwrap to ensure that the beer stayed in an optimal temperature range for the yeast. Use candi syrup and CBC-1 yeast to carbonate the beer. This one came out carbonated but only very lightly. It really should have been more carbonated. A couple of bottles I added extra carb drops to were much closer to what I wanted. If you're looking for another take on a Westvleteren XII clone, check out the recipe section at the Candi Syrup, Inc. web site. If I make another Westvleteren XII clone, theirs is probably the recipe that I'll try.